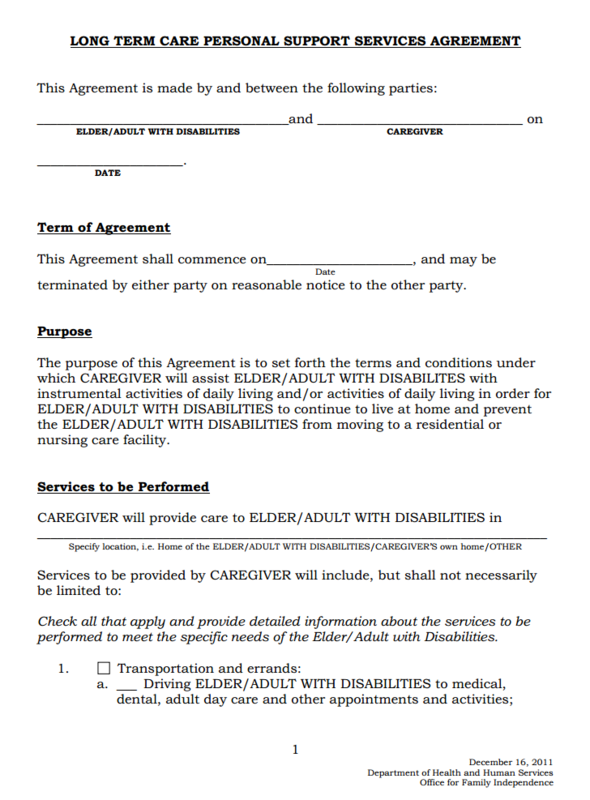 This Long Term Care and Personal Support Agreement is a template that helps Elders or Adults with disabilities get a legal, contracted Caregiver. The agreement lets one have a legal documentation of the contract that is written out between the two parties with all the terms and conditions to ensure a hassle free experience. The full name of the Elder/Adult with disabilities and the Caregiver. The date on which this agreement is being made on. The date of commencement of this service agreement. Any one of the parties can terminate this agreement on reasonable notice given to the other party. Transportation and Errands to be performed for the elder/adult with disabilities. Preparing meals and snacks per day. Housework; cleaning the living area, doing the laundry and changing the linens. Paying the bills, balancing their checkbook, making deposits, dealing with health insurance and other paperwork. Assisting with the daily living activities like; transferring from bed, chair and toilet, ambulation, bathing, hygiene / grooming, eating etc. Monitoring the elder/adult with disabilities for safety, responding to alarm system to control wandering/ fall risk. Then you have to fill in the complete details of the Schedule, of the services that the caregiver will provide. Details of the compensation to be provided to the caregiver in return for the services provided. Any extra reimbursement to be paid to the caregiver for all out of pocket expenses bone in connection with the caregiver’s work. You can fill in all the details as per your needs and modify it to suit your needs, download this Long Term Care Personal Support Agreement by clicking on the download link below.